With all of the recent headlines about plant closures by General Motors, there’s good news for some auto workers in Windsor-Essex. There is job security for the thousand employees at the Ford Annex Engine Plant as final testing is now underway on production of a massive new 7.3-litre gas V8 engine. 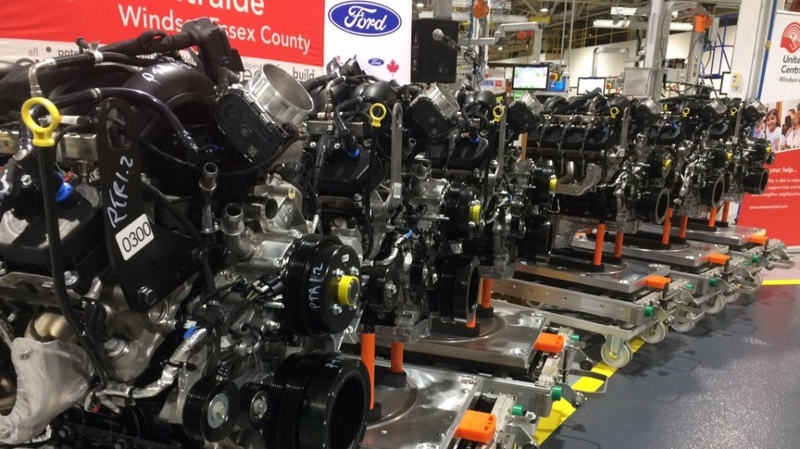 "The equipment is being put to the test and so are the engines,” said Tony Savoni, Ford Windsor Operations Site Manager. “Throughout the rest of this year and throughout early 2020, we will be at full running capacity." In 2016, Ford announced a $600-million investment in its Windsor operations. On Thursday, six completed engines were on display at the plant as local Ford employees announced a donation of $562,693 for the United Way of Windsor-Essex. “The 7.3-litre is expected to be the most powerful gas V8 in its class – providing durability, ease of maintenance, and all the towing and payload capability our customers want,” added Savoni. The 7.3L gas V8 will be one of three engine options for the new 2020 Ford F-series super duty truck. The news comes at a time when nearly 3,000 GM workers in Oshawa fight to keep their plant open past 2019. Ford employee John D'Agnolo knows this feeling. He use to work at the General Motors trim plant, then transferred to Scarborough before returning to Windsor. He tells CTV Windsor that Ford is poised to take business away from GM. "Ford is looking at the people who are buying the vehicles, where their profits are coming from,” says D’Agnolo. About 1,700 people work at the three Ford plants in Windsor-Essex. The new engine production will allow the automaker to add to its workforce, while also securing jobs for people who supply parts to Ford. A number of employees transferred out of Windsor to plants in Oakville and Bramalea when Ford announced 500 local layoffs in 2010. Unifor says those employees will be offered jobs first when production of the new V8 engine is ready to begin in late spring.